My son is one today. Those are the strangest five words for me to type. The fact that I have a child is the first oddity of that statement since I sometimes feel as if I’m just a little girl playing house. Does that feeling ever go away? The second half of that declaration also boggles the mind because how is it possible that I have been “playing house” with a living, breathing little boy in my care for one full year? I wish the only thing I felt today was sentimental as Howard and I think back on the day we welcomed our little one into our lives. Months of reading blog posts, watching YouTube videos, and chatting with friends who already had children prepared me for the fact that birth plans sometimes fly out the window. In actuality, I never made a birth plan. Is this something parents-to-be are supposed to write? I never did figure that out, haha. I might not have had a plan for the birth, but I know my expectations were flipped and a tiny bit trampled. My understanding of labor and delivery as a child stemmed from whatever Hollywood put forth. I religiously watched Nine Months with Hugh Grant and Julianne Moore each time it was played on TBS. Though obviously exaggerated for comedic purposes, it provided the minimal knowledge of what birth would be like when I was to have my own baby. My expectations included my water suddenly breaking, a rushed car ride to the hospital (minus the extra passengers being thrown in the back seat), and a speedy labor ending with the prompt delivery of the baby after a few good, hard pushes. I knew that the movies and television shows weren’t realistic. I mean, what baby enters the world completely smooth and clean? It would be a gift if it were possible to easily have babies in an elevator like Mrs. Belding did on Saved by the Bell … minus the earthquake, of course. A little bundle of joy wrapped up in a Bayside football jersey seems the perfect ending to 9 months of pregnancy. Oh, and let’s not forget these women do this with nary a hair out of place. The arrival of my son was anything but unexpected. 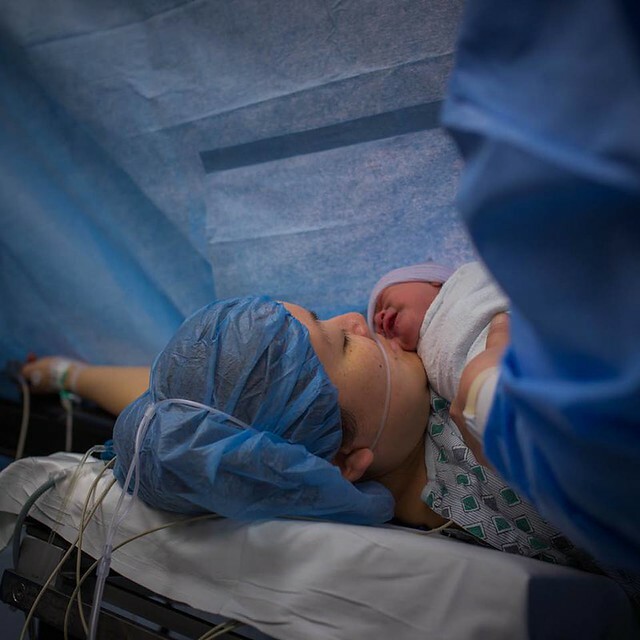 Due to my having mild placenta previa, I had no choice but to schedule a C-section for the day after I turned 38 weeks. I read what I could about the surgery since I’m not one for surprises. The anticipation and subsequent anxiety can affect me more than the actual experience. Case in point, I was nervous about the spinal block because the idea of a needle in the spine made me cringe, but when it came time to hop (or should I say, struggle to situate my pregnant self) on the table in the operating room with my back towards the anesthesiologist, I was strangely calm because of what I had read in advance. However, I feel naive now thinking back about how my apprehension revolved around a needle prick that would only be a few minutes of the entire ordeal (by the way, the IV in the hand was more painful than the needle in the back!). And yes, I am labeling the delivery of my son an ordeal. There was a lengthy amount of time when I felt as if I were being suffocated by an elephant on my chest, which in turn became one of Howard’s terrifying moments as I struggled to whisper to him, “I can’t breathe.” When that difficulty was lifted, I was pummeled with the nausea that made me worry that my uncontrollable gagging while lying on the table would cause me to move too much while my doctor was standing there with a scalpel in her hand. That nausea decided to stick with me throughout the duration of my stay in recovery as I couldn’t even hold my own baby because I was feeling incredibly ill. I was only a few hours in my new role as a mother, and I was lying there with my eyes closed hoping that I would start feeling like a human again soon instead of relishing every moment with my son. He was crying because he was hungry, and I had to summon every ounce of willpower in me to feed him. I felt like a failure. The memories of that day are still fresh. You know how women claim that they forget what childbirth was like and therefore are willing to have another baby? I haven’t forgotten. I haven’t forgotten that pain-filled day, the days that followed in the hospital, and the weeks at home as I struggled to fulfill my duties as a mom while also wanting nothing more than to just lie in bed to fully recover. It was so rough that Howard and I now have an understanding that because I had the first child, it’s his responsibility to have the second one! But all joking aside, would I do it again? Would I put myself through each one of those experiences for my little Zachariah boy? Absolutely I would. Amid the moments that still make me cringe, there are moments from that day that bring tears to my eyes if I just pause and let myself remember those details. That first look. That first kiss. Those two memories are just as fresh and vivid as the harrowing ones. When the nurse pulled back the small curtain on the operating table partition between me and the part of me that I definitely didn’t want to see, Howard and I saw the tiniest little human being held by my doctor. The tears that filled my eyes were instantaneous and not expected. For months, we had been seeing his form and his baby movements in the ultrasounds. We had seen him kick, cover his face with his leg, and even yawn in utero. We knew from those pictures whose nose he would have! But even the most state-of-the-art technology couldn’t prepare us for the wondrous phenomenon of laying eyes on our child for the very first time. And then just when I thought I couldn’t love our wrinkly baby more after just one look, the nurse brought him over to me. THERE HE WAS. I was meeting my son! Sure, I had been carrying him and seeing his feet kick, experiencing discomfort when he wedged his tiny foot behind my ribs, and feeling the staccato jumps as he dealt with hiccuping episodes at least once a day, but this was him right in front of my eyes. I might have said something to him. I might have cried more. It’s a little hazy in my recollection. But what I so distinctly remember is that first kiss. My lips on his tiny, soft cheek was by far one of the best moments of my entire lifetime and thankfully, my husband captured it with his camera! In the past 365 days, I have kissed my son’s cheeks, his forehead, his hands, his feet, and his cute belly, but nothing compares to that first kiss. I knew that my husband meeting our son for the first time was going to be incredible since he couldn’t feel every movement the way I did, but I was unprepared for just how extraordinary it would be for me. As I think about those movies and TV shows I watched, not one of them captured that profound moment in a way that could come close to the reality of having my own baby boy right there in front of me. The third and final category for the Card Design Superstar contest was the “Innovation Master.” This was the one that gave me plenty to think about when I was lying awake at night when my son was fussing due to teething. I thought about shaker cards and magnets. I thought about Velcro and even went to Michaels yesterday to purchase small pieces of Velcro for an idea that ended up not working out late last night. All the ideas I had were too difficult to accomplish when I don’t have time to craft and fiddle with all the components. Instead of playing with my crafty tools, my day is comprised of feeding the little one and myself, being a jungle gym for the little one, and finally resorting to playing Daniel Tiger for the little one as I attempt to complete some household duties. At the end of the day, clean underwear is more important than trying to make my innovative ideas come to life. That’s why when it came down to finally making this card, I went with my tried and true favorite: pop-up cards. I didn’t do anything fancy with two or three layers. It was essentially a throwback to my elementary school days when I first learned how to make them with my art teacher. I even used it in junior high to make a rather large pop-up book describing the Bill of Rights for my social studies project. It only seemed fitting to use it for this card as well. 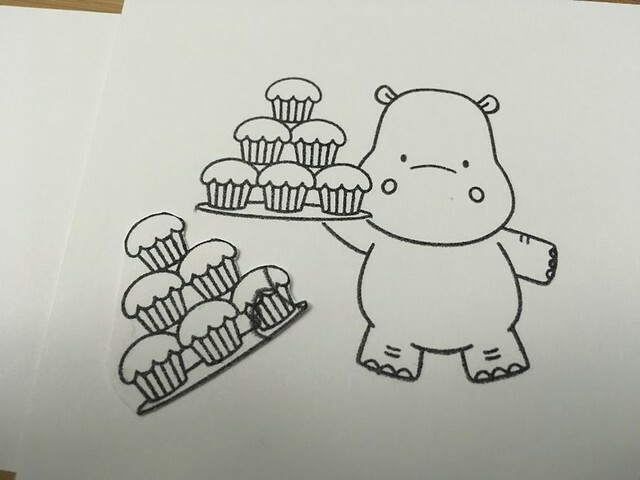 Thankfully, hippos are much cuter to color than poorly drawn men holding guns to represent the right to bear arms. 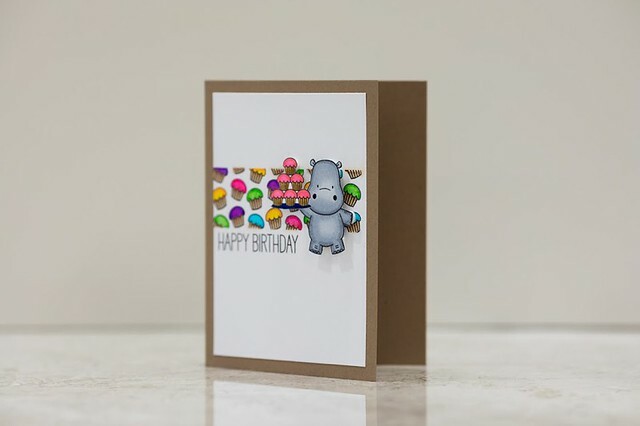 All of the images were from “Happy Hippos,” but I also used the “Emmitt Alphabet” dies for the letters on the banner and “Written in Watercolor” for the birthday sentiment inside. Tobias is my nephew although we actually call him Toby. I wanted to include a banner because my sister-in-law always has the cutest banners for my niece’s and nephew’s birthday parties. 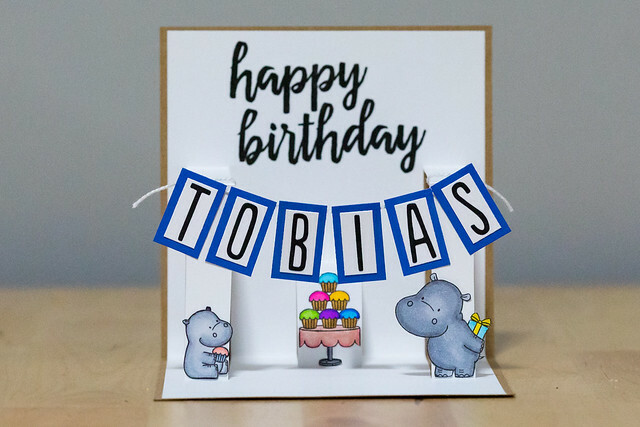 When piecing this together, I did see that the size didn’t quite make sense proportionately, but this is also a party for hippos so I think it’s easy to pretend it all makes sense, haha. Oh, it also should be stated that Toby’s birthday is in August so this is a card that is about 11 months too early! But hey, if papercrafters can have Christmas in July and start prepping for December, I think it’s okay that it’s September and I’m prepping for the following August, right? Right. The second category I entered for the contest with My Favorite Things was the “Coloring Virtuoso.” Despite having been involved in the crafting world since I was very young, I wouldn’t consider myself good at coloring since I only began using special tools recently. 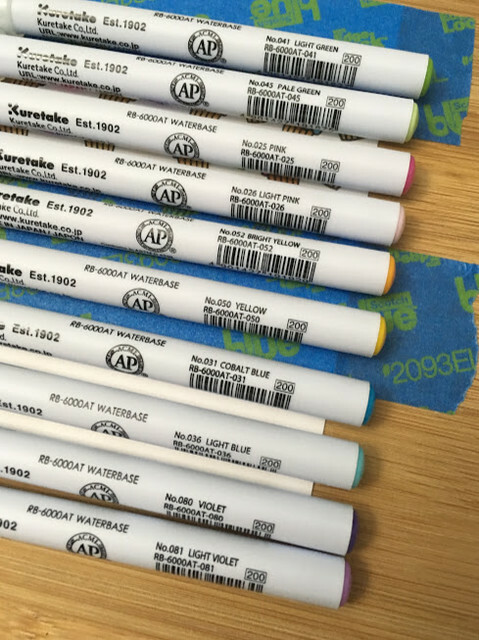 When I had to color in stamps, I used the set of 8 Crayola markers! That meant that everything that needed to be brown was the same shade. Tree trunk? Crayola brown. Bear? Crayola brown. Hair? Crayola brown. I mean, if anything, there wasn’t much thought required, haha. After being bored with those 8 colors, I dabbled a little bit with Crayola colored pencils and baby oil because I had a set of 36, which meant 28 more color choices (I mentioned in the other post that I taught math, haha). 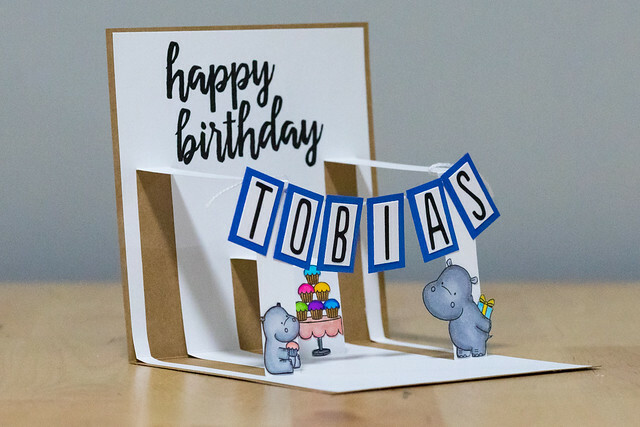 I even made a YouTube video of the technique way before there were so many excellent papercrafters sharing their skills through that avenue. But most of the cards that I made were done using my Cricut Expression and then my Silhouette Cameo. Once I had those machines, I didn’t spend as much time on stamping other than using them for the card sentiments. Nowadays, thanks to crafters like Jennifer McGuire, I have started buying stamps again and thus needed a way to color them. I purchased some Copics a few years ago but more so to have options when coloring all those tree trunks, bears, and hair. Recently, I started purchasing them one at a time to fill in the gaps using the Michaels 50% coupons (the employees always say, “Just one?” when they open the cage for me), and I also added a set of 60 Zig Clean Color Real Brush Pens. It only made sense that I use both of them on this card even though I’m nowhere near a virtuoso. Seriously, look at some of the other entries. They’re gorgeous! 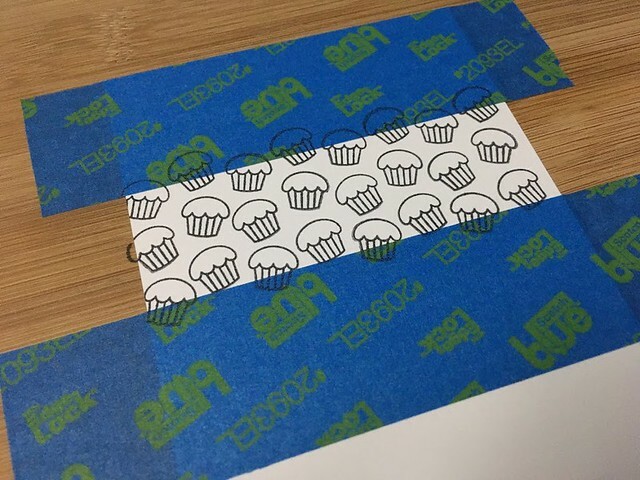 Since we moved into our house a little over a year ago, we still have plenty of painter’s tape, so I used that to mask off a section of the cardstock before randomly stamping the cupcakes everywhere. Yes, everywhere as in, even on the cutting board I was working on … whoops. 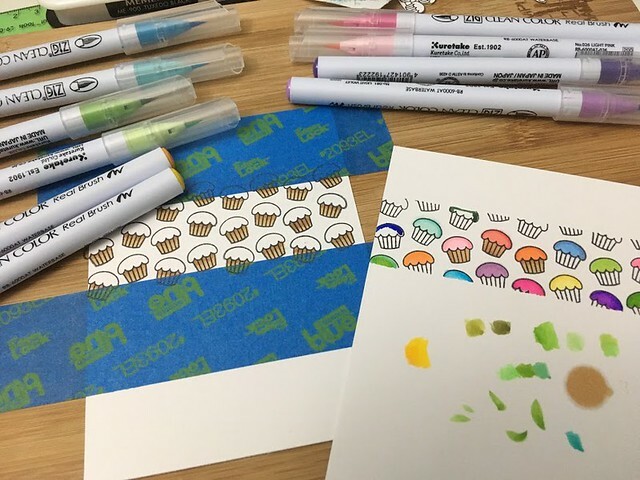 I did try it before on a different sheet of cardstock but tore the paper when taking the tape off, so it was an extra piece for me to test out colors. 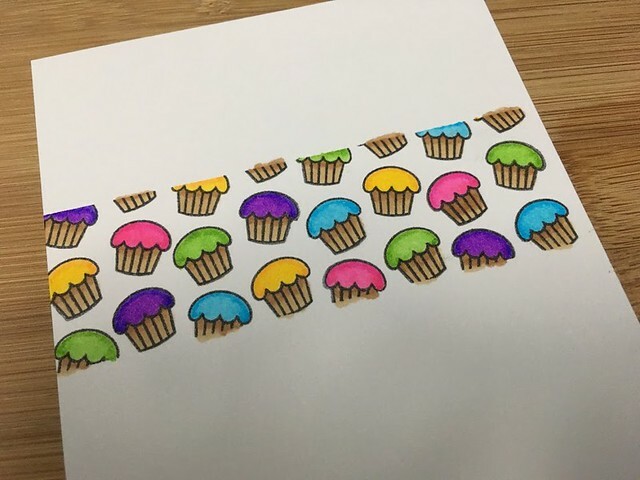 The Copics bled a little, so I switched to using Zig Clean Color on the tops of the cupcakes. If only I had known beforehand of the frustration I would encounter a little while later, I would have used those for the bottoms of the cupcakes as well. For a second, I thought about the colors I was using, but then I figured there are so many flavors of cupcakes these days that every color is a possibility for the frosting. Green? Pistachio, mint, or green tea. Pink? Strawberry, raspberry, or cherry. Yellow? Lemon. Blue? Blueberry. Violet? Lavender or ube. Mmm, who else is thinking about cupcakes right now? Anyway, I used two shades of the same color, and Zig made it easy on me because I pulled out anything that said “light” on it to use as the lighter shade. Unfortunately, this is where I had a little bit of an issue. Actually, let’s be real. It was more than a “little.” This is where I got frustrated and almost gave up entirely. Can you see what happened when I pulled up the painter’s tape? Ughhh, Copic marker bleeding! Haha, a virtuoso would not have made the mistake I did. First of all, I was using Strathmore Bristol Smooth. I haven’t yet made the plunge to purchase any Neenah cardstock. Secondly, the painter’s tape doesn’t help when ink soaks INTO the paper! What can I say? I learned an important lesson for my future cards! Thank goodness for that colorless blender! It took some time, but I used it to “push” the color back in before I could let the paper dry and then push it in some more. It wasn’t as crisp and clean as it could have been, but I was relieved that it was still usable. The last step was to add the hippo. This was actually the first set I felt I HAD to purchase when it was released just a few months ago. 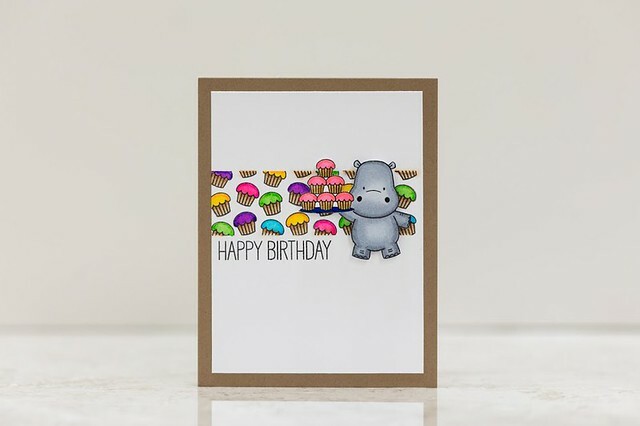 I stamped the tray of cupcakes first (after cutting off the stand portion) and then used a mask to stamp the hippo. 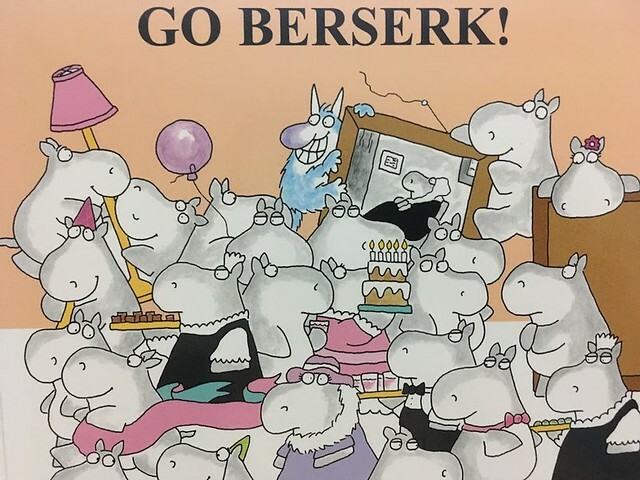 Is it just me or does this remind you of the 9 hippos that come to work in Sandra Boynton’s Hippos Go Beserk! book? Oh wait, maybe THAT’S why I all of a sudden felt the need to buy something with hippos! Haha, oh Sandra, look what you made me do. I colored the little hippo (who clearly went to work without his proper uniform) using Copic markers. I’m so glad I added C3 to my stash recently. I have been using C1, C3, and C5 for anything that has to be gray. 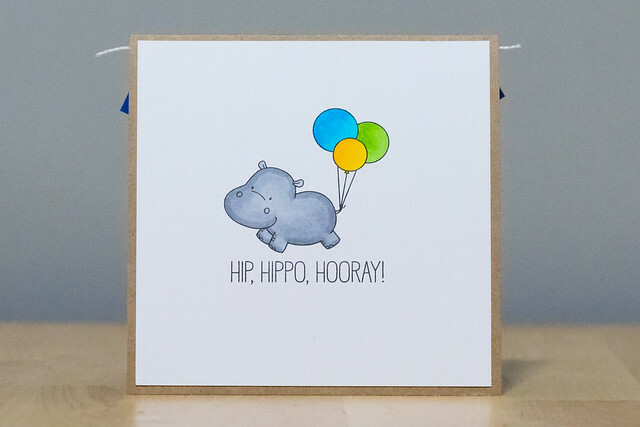 Hippos, elephants, and penguins … huh, it seems that gray is the new brown. Anyway, for some reason, I don’t seem to have issues with this combination bleeding, so I think everything in the future will have these 3 colors including those tree trunks, bears, and hair. I popped that fella up with some foam adhesive, added the sentiment (imagine if I stamped it crooked?!) and called it a night! I actually should’ve called it the wee hours of the morning because it was 2AM when I finally finished this and went to bed. This ain’t no hippo party where “all through the hippo night, hippos play with great delight.” This is a “when the baby’s asleep, find some time to craft-eep!” Okay, I’m working on the coloring, but I’ll also work on the rhyming. Hmm, Card Design Superstar. Those words aren’t necessarily what I would use to describe myself even though I have been papercrafting since I was in elementary school. Even so, I think I am excited to try to earn that title by entering the contest by My Favorite Things! The first category is for the “Clean and Simple Genius.” What’s interesting about clean and simple (or CAS) cards is the fact that my husband Howard is the one who really tried to steer me towards this direction even before we were married. I loved the patterned paper look, which is why I have a hefty collection of 12×12 paper pads. But he liked the look of having white space on a card. Over time, I started to agree and realized that there is a time and place for both styles. Even though they are labeled “simple,” sometimes they are anything but that! The challenge guidelines mention an “ innate understanding of design” along with “white space, color theory, and design rules.” It’s hard to admit that I don’t know much about any of those things, but I am constantly inspired by other papercrafters and sometimes just setting aside time to give a detailed look at the stamps I own can get the crafting mojo going! And that’s exactly what I did for this card. I knew that I wanted to use the “Get Down to Business” set. The reason why I purchased it during the recent MFT retirement sale is because it reminded me so much of The Office! Plus, as a former middle school teacher, I just had to have the set that had school supplies on it especially since I also taught math. 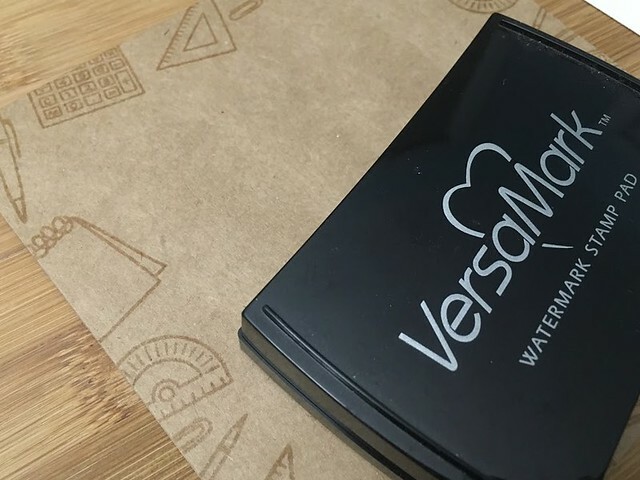 I used the VersaMark ink pad, which is a watermark stamp pad so it’s perfect for tone-on-tone stamping. 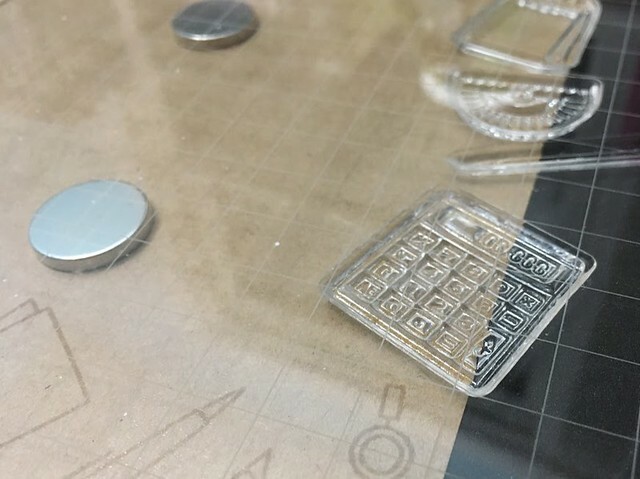 Since this was a clean and simple challenge, I wanted to be able to use the stamps without drawing too much attention. I did use my Hampton Art Stamp Perfect, which apparently is no longer being made due to the lawsuit with the owner of the MISTI, but I also free hand stamped some of the smaller images like the paperclip to fill in the gaps. That was the only part I had planned! 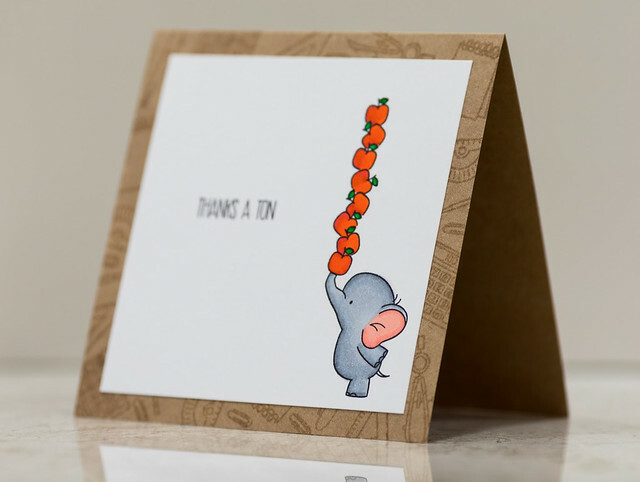 I sat and looked at all of my little critters and also paid special attention to the smaller stamps in the sets and decided on the little elephant from “Adorable Elephants” and the apple from “Farm-tastic.” I started really liking the idea of the card, which turned into a thank you card for a teacher because those were my favorite to receive at the beginning of the year. Most students and parents give cards during the Christmas season and some write a quick thank you at the end of the year, but I have a fond memory from my first year of teaching in 2007. I was a nervous wreck, as expected, and one of my students gave me a brown paper bag with an apple in it. From then on, his nickname when talking about him was Apple Andrew. He graduated college this past year, and yes, he and his family know full well that that is his name, haha. He and his sister (who I had a few years later and gave me an orange on the first day of school!) played the piano and sang at my wedding. 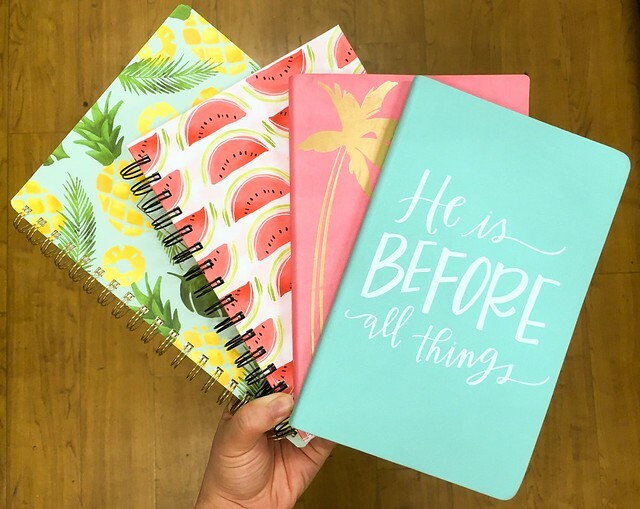 Anyway, the point is that a note or thoughtful gift can really help a teacher get through the stress of the beginning of the school … or at any point of the school year! The first card I made using regular cardstock to play around with placement was not exactly what I wanted the final result to be. I really liked it and would probably make cards like this for mass production, but it still seemed too straightforward for the challenge. 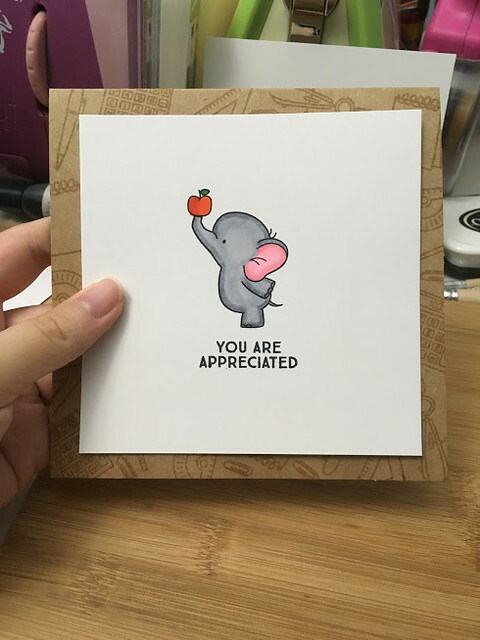 I decided to shift the location of the elephant, add more apples using simple masking, and change the sentiment. 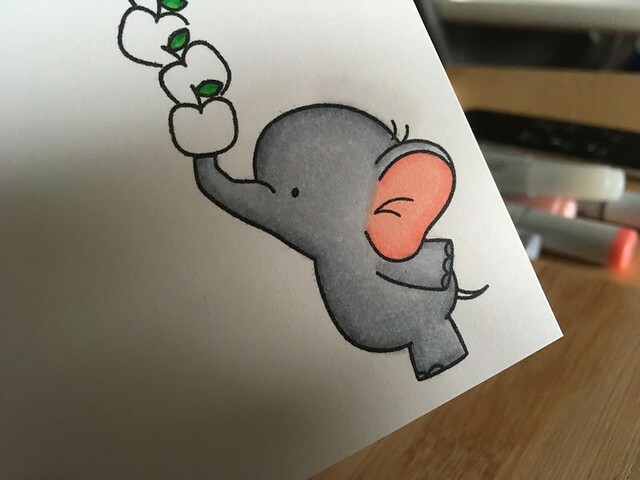 The elephant was stamped with Memento ink because I used Copics to color. I purchased Copics a few years ago but never really used them to their full potential. With Kathy Racoosin’s “30 Day Coloring Challenge,” I experimented a little more and really liked the results! I’m in need of practice, but being able to get any kind of a blended look is rather exciting for me! 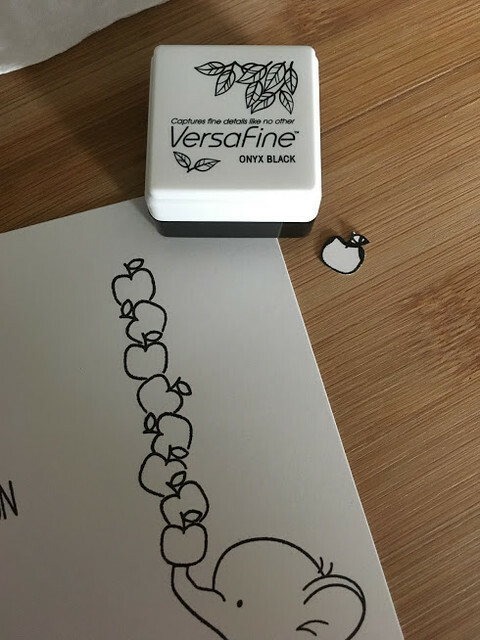 The apples were stamped with Versafine because I used my Zig Clean Color Real Brush Markers for those because I don’t have red shades in Copics. Lastly, I changed the sentiment to be simpler with thinner lines. 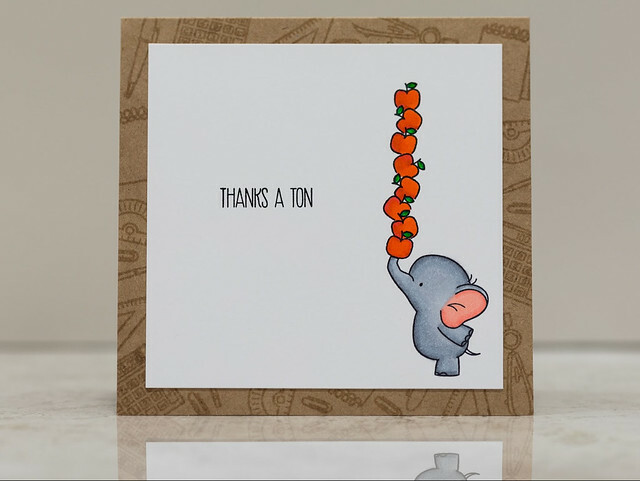 I chose the “Thanks a Ton” from “Sweet Safari,” which means I used 4 of my new sets on just one card! I think I’m going to have to look at many stamp sets at once from now on so that I can pick and choose what to use together. There are some FANTASTIC entries in this category, but I still have my fingers crossed anyway! I’m hoping that those of you who are in the medical profession might be able to help me. I’ve had this malady for years. From what I can recall, it may have begun when I was in high school. Actually, I think it’s safe to say that I had signs of it in elementary school. I have suffered in silence for too long, and I need to know the name of this infirmity. What is it called when you have this insatiable yearning to purchase new journals despite never having finished one in its entirety?! Why are blank journals so attractive? The colorful, creative covers provide the initial enticement, but the structure and pages are just as important. For some time, I went through a phase of wanting them to be spiral-bound. It made it easier to write because I didn’t have to battle with the binding. But then I was introduced to the wonder of lay flat journals. As for the lines, they had to be college-ruled or it would be too reminiscent of my first diary in 5th grade when the subject of most of my entries focused on wanting a boy – any boy – to ask me to the dance. Yes, that was apparently a vital concern of my 10-year old self. My final specification required the pages to be blank. I didn’t want pictures or floral detailing in the corners because then I didn’t feel accomplished when I filled an entire page with my inner ramblings. Plus, having Bible verses on the bottom of the pages wouldn’t have fit my “I like these 5 boys in my class” theme. But regardless of all the criteria I may have for journals, it all boils down to one thing. A blank journal is overflowing with new possibilities and a fresh start. There’s the ability to write neatly with your latest handwriting (I can’t be the only one that used to experiment and subsequently change how I wrote at the beginning of each new school year) or incorporate a new format, like how one of the popular things to do these days is bullet journaling. In this digital age, this new journal syndrome has translated to blogs. This blog here isn’t my first rodeo. I was once a diehard Xanga fan in high school. I recapped my daily life especially church on Sundays and began carrying around my dad’s digital camera with the purpose of documenting even the mundane for the sake of memory keeping. In fact, I firmly believe that I am one of the first people who was dedicated to taking and posting food pictures online long before it became as popular as it has on Instagram. It was a way to preserve the memories I was making. Alas, Xanga is no longer in existence, but I had already moved on to bigger and better things at that point. I switched to Blogger with the intention of documenting my new life with my husband who was at that point, my fiance as we had just been newly engaged. It morphed into a blog for my handmade cards along with my memory keeping, but I also recounted my victories when I entered the couponing world and purchased rather large hauls with just the change in my wallet. I challenged myself to write a little for an entire year, but I was not successful since being a middle school teacher forced me to eliminate the phrase “free time” from my vocabulary. However, now I am making the switch to WordPress. The first reason is because of the mess that occurred when Photobucket decided to stop offering free hosting. Years of blogging on Blogger are ruined as the pictures are now gone. I could go back and find them and add them once again, but as a mom of an almost 11-month old, who has the time? In fact, if I told you how long this one entry took me, you’d be wondering why I’m even attempting to start a new blog at all! But the second reason is the same as why I continue to ogle new journals at the stores. This is a fresh start. This is a new beginning. I hope to write with intention, so if that means a post is not ready to be made public, it stays private until it is acceptable. Though it was therapeutic to write every day for most of that year, there is no longevity in a CVS haul although I still personally enjoy looking back on my penny-pinching days! It is in my DNA (okay, so I’m making that up) to cope with my emotions and work through my thoughts by writing. That’s why I have a journal app on my phone because at times there’s an urgency to type things out. But writing privately and writing for an audience are two different things, and I am crossing my fingers and toes that I will have readers who might be interested in the stories and experiences that I share. Okay, I’m ready now. Are you?